This is rather a sort of perverse case of "There is death in the hane", I suppose. ;) Black expects to make a slight gain by pushing into White's territory along the side, gaining one point basically. White throws a surprise by making a hane as well, even though it's in atari! Actually, this is a throw-in tesuji. Black captures, but when White plays at , it's all over. There is no where for Black to make eyes. After the play at , there is one eye at the bottom, and the top eye is sealed by playing at or . 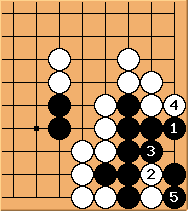 Those points are miai - since White can't play at both simultaneously, Black takes the other and lives. Note that miai are often a good source of ko threats, and indeed White would get one there. 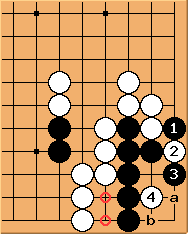 If White plays anywhere else, Black at divides the space into two parts. This is White's first ko threat in this situation. still divides the space into two parts, but White isn't done yet because of how the stones are positioned inside the bottom eye. is the second ko threat, threatening to capture. Black must capture first, and is now safe. Of course, White would only play and as ko threats when an actual ko comes up; otherwise it's just wasting those threats. Back to the original discussion. When Black plays in the original diagram, White can play and Black's safety is threatened - the player weak enough to play probably doesn't even realize that at the moment, but is simply happy to capture a stone that White seems to be throwing away. Black is still doomed if he doesn't capture, though. For example, if he suddenly realizes the problem and plays at in the original diagram to start making eyes, White plays at and now that eye is destroyed - another miai situation. Once Black captures, he would like to play at , making two eyes. But it's White's turn, and kills the group. Basically, Black got too greedy here. Originally either or would let Black live - but only if he played one of them right away. So those points weren't miai. Now, I will work my mid-kyu magic, and remove four stones from the board without changing the situation! 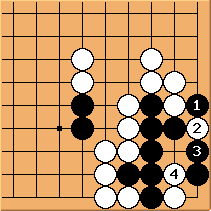 Here the same sequence of moves is played with the same result, despite the removed stones. still kills, because has reduced the space to bulky five and White, having the move, strikes at the vital point. (See life and death if you don't understand this.) Again, at would have resulted in life, as would or even a, if I'm thinking clearly. Don't be greedy. Ensuring life is more important than making one-point plays that only work if the group lives. In a tsumego, the person who makes the first capture often loses. Learn the throw-in tesuji. It can cause snapbacks, set up oiotoshi, and - perhaps most importantly - steal eyes. Capturing isn't everything. Again, don't be greedy. There is death in the hane. There is suicide in the hane, too, because at the edge of the board, what is hane for one player is descent for the other - that is, making a hane doesn't prevent your opponent from making one. Learn to recognize life and death situations. One eye is worth more than a liberty perhaps (see Eyes Win Semeais); a big eye is worth several liberties depending on its size (see nakade liberties); but two eyes is worth infinite liberties. Plus they count as points at the end of the game; unsurrounded liberties don't.